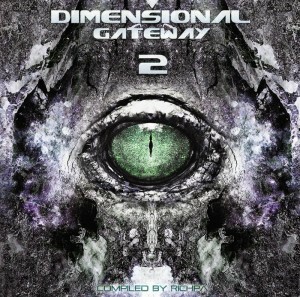 After exactly one year, Neogoa‘s first compilation (voted the best compilation of 2010) gets a sequel: Dimensional Gateway 2. Over 120 minutes of high-quality Goa trance and psytrance music from all over the world is presented on this compilation alongside printable cover artwork and high-resolution wallpapers and posters. The style of the first part of this compilation can be described as darker and more experimental while the second part focuses more on melodic side of Goa trance. All tracks were carefully selected by label head Richpa, while mastering was done by Igor Čeranić at Deimos Soundlabs and cover artwork design by Ivan Parić at Neogoa Design. MP3 Download | FLAC Download | WAV Download · Download count: 16,255. Glad to be part of it!!! Congrats Ritchpa and all involved in neogoa work…amazing work in all that time…this close this cycle perfectly! Really glad i worked on the first and the last VA of neogoa, wish u soooo much luck mate with your future projects ! All the tracks of this VA are the product of a very deep work ! Special comment from what I heard for the moment (CD1) : Daimon done an amazing acid track, Deimos made a very unique tune too and the chillout of Erot is perfect !! just 1 word Amazing cd!!! The first part would only get 3 stars from me, and that solely because of the Daimon track that rocks this whole release (I knew it would after reading the artist’s name). There’s simply too much stuff missing a decent melody imo. Overall it’s a decent release with its highs and lows, more highs however ;). Keep up the good work! Psychowave, love your track! Thanks! PS: Deimos, your mastering is perfect !! @PharaOm – tnx, I tend not to subjugate myself to the loudness war that’s getting worse by the year. Your track is one of my favourite on the compilation, both by the style and production quality. Release of the year, right here! Goa Trance forever. I have to say I really like the artwork, and the mastering is sweet. Thanks for an awesome release guys! can’t wait to hear whatever you all have in store for us next. super album…. keep it coming!!! Great compilation, thanks everyone! I have to listen a number of times to get my favourites. But I definitely did enjoy the whole CD2, I was in a good mood and did dance a lot alone in my room :) Just perfect positive energy for a sunday evening. Oy vey. Let’s see… Aerosis, Cybernetica, BlackStarrFinale and Trinodia tracks contained in one album, Deimos does the mastering and Neogoa is at the helm. The result? The best Goa album yet! This has to be much better than the first DG compliation, and that is saying a lot. Not to mention three mind-splitting downtempo tracks to open, interlude and end this collection is sweet. Thank Basilisk for another awesome entry! I’m chuffed to be part of this fantastic compilation, the best in the genre in quite some time in my biased opinion. The album art is out of this world as well. Thanks to Mr Paric for all his hard work, and to Igor for such respectful mastering. Farewell Neogoa! Deimos stands out from the first part..
Cosmic silence, Nova fractal and Trinodia from part 2..
Because a track like cellar door was not there..
Really glad to get this track onto the final compilation in the Neogoa “world” :) Best wishes for the continuing work forward for Richpa. Mastering on this one was really good and brought out the better energy in my track, Lasers and Demons. Thank you all for your feedbacks and comments, I’m really happy to see that our effort is appriciated and it’s a huge motivation for my futher work in nowdays Goa trance scene. Kudos to all who followed our work during the last year, especially to all artists who kindly shared their art with us. I love the whole albumǃ BTW what language, if it isn’t gibberish, is being spoken in Pataxo Ayonat? Sounds like Russian but I can’t tell for sure. At news year of 2010/2011, more one psychedelic festival has problems with permissions and authorities. That time the 303ArtFestival projected to receive 5.000 people on a beautiful beach at South of Bahia, Brazil. But that time they could not break the gathering! In addition to the action of the organizers the festival had the support of a local tribe called “Pataxó”. After the authorities cancel the permissions, the tribe close a road near to the festival in a support manifest behalf the festival. With all these forces, hours before the festival opens, the court get the permissions again, and the festival happens. Ayonat means help in maxakali language, spoken by the local tribe, and the voice samples on the track are from your leader speaking about what was happened, recorded at the manifest moment. That’s the way I found to say thank you to the local tribe, which helps the organizers to make this gathering possible that I have the pleasure to participate. nice Goanic purpose to play some Trance in Open-Air!